Coyotes have increased in numbers and range in the past fifty years, primarily because of human impact on the environment. They are now found almost everywhere in North America. Coyotes have been demonized by cartoons and the media; however, they are just another example of wildlife trying to survive in an ever-shrinking habitat and against the odds. They are highly intelligent, social, adaptable and opportunistic. Coyotes resemble small German shepherd dogs with longer, narrower snouts and bushy black-tipped tails. Their coats come in shades of rust, brown and gray. Males are larger and heavier, weighing between 20 and 35 lbs; females are smaller and weigh between 18 and 25 lbs. Recently, larger coyotes have been noted in some parts of the country. Some have suggested that these are hybrid coyotes whose parents mated with wolves; however, it is also possible that natural selection has allowed the survival of larger sized lines from successful populations residing in richer habitats. Coyotes are generally monogamous. Interestingly, males only produce sperm during the very short breeding season; females come into heat for a two to four week period once a year in late January or February. Between four and seven pups are born March or April; the litter size depends on the female’s nutritional status (i.e. food availability and coyote population density). Parents and offspring remain together in family group s for about six months. Dens are excavated in the soil, sometimes expanding burrows of other animals. Coyotes will often have more than one den, and these may include hollow logs, rock piles, and other available natural shelters. If disturbed, parents may move litter to alternate den. They tend to avoid human habitats even in suburban areas. By late fall, juveniles often disperse to live independently, although they may stay with the parents for an additional year if food abundant. Coyotes exploit a flexible habitat and can be found anywhere in California, including arid regions, wet meadows, and along the foggy coast. They are not as common in densely forested regions or in agricultural environments. In recent decades, coyotes are more numerous in many suburbs with ample food sources. Some of the highest population densities on record occur in suburban Southern California. Territoriality may be optional for coyotes. 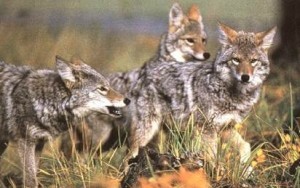 Adult coyotes may be nomadic or transient and can travel wide areas. They may also choose to defend distinct territories especially during breeding season and while rearing their young. If food is abundant, territories may be smaller; when food is scarce territories expand and can be greater than 15 sq mi in arid areas. Along California’s Coast, coyotes may range in territories of 1 – 3 sq mi, and in the suburbs of Los Angeles, territories may be as small as ¼ of sq mi. Coyotes are generally less social with each other than are wolves. Although packs of up to ten related individuals can form, they are more usually solitary or in breeding pairs. 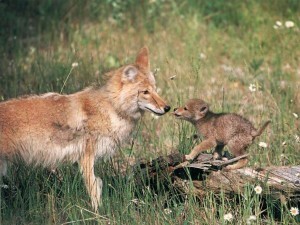 Dominant, territorial pairs may share their space with their juvenile offspring or other related coyotes when food is abundant. Coyotes are crepuscular, meaning that they are most active after dusk and before daylight. They can be heard barking and howling in evening and night year long. They do vocalize less in springtime during the early stages of pup-rearing. Diets are diverse and adaptable, varying according to local or seasonal availability. Rodents or rabbits are their prey of choice if available; however, coyotes are opportunistic scavengers and hunters, and will also eat insects, fruits, berries, and birds. Coyote pairs or packs can kill full-grown deer and other domestic farm prey that may include poultry, sheep, goats, and calves. If an individual learns to kill livestock or pets, it will likely continue unless effectively deterred or prevented. Coyotes appear to show a trend toward more confident behaviors. Some local coyote populations ignore people (as opposed to running from or avoiding contact with them), whereas some individuals are increasingly aggressive to humans especially in suburban Southern California. There have been reports of stalk attacks of children or adults, as well as attacks of pets on leash walk with their owners. One fatal attack of a 3-year-old girl in front yard occurred in 1981; other attacks resulted in serious injuries. Over 160 such attacks are recorded in California since the 1970s. Use refuse containers w/ tight-fitting lids. Eliminate man-made ponds or fountains; these are easy watering holes for all wildlife and are particularly attractive to predators if they contain potential food like koi fish. Keep small pets (all cats, rabbits, small or aging dogs) inside. Never let small or aging dogs out in your yard alone. Coyotes will learn their outing schedule and take advantage of any opportunity of easy prey. If outdoors, keep in enclosed kennels with very high walls and preferably with an enclosed roof as well. Discontinue use of doggy doors, particularly when you are absent and can’t monitor your pet’s whereabouts. 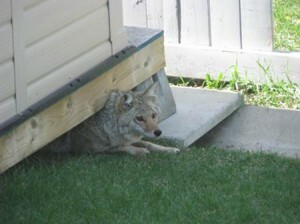 Block crawl spaces under homes, porches, decks and garden sheds; these make great places for coyotes to rest or rear their young. Bring even large dogs inside after dark. Don’t leave them outside and unsupervised during the day time. Coyotes may hunt in pairs or packs and there are reports of group coyote attack large dogs, especially in the suburbs. Never allow your cats or dogs to run free at any time; they will attract coyotes to your neighborhood and are easy prey. Most outdoor cats simply disappear when coyotes discover them. Leash walk your dog in high pedestrian, populated areas. Bring a walking stick or cane as potential weapons on walks with or without your dog in more remote areas or if coyotes have been spotted in your neighborhood. Avoid walking at dawn or dusk when coyotes are still most active. Avoid walking or running with or without your dog at predictable times or along the same route. Remember, coyotes scope out the area, learn your schedule and wait in ambush. Add an apron of galvanized wire-mesh to the bottom of fence 4 â€“ 6 inches below the soil and extending outward at least 15 inches to deter digging. Add a wire-mesh overhang of at least 18 inches slanted outward to the top of the fence to prevent climbing over the top. Even when fencing fails to keep coyotes out, it will at least give you some idea of the weakness in your perimeter. For example, the coyote may have left evidence of where/ how she or he penetrated the fence (e.g. hair) so that you can fortify the barrier most effectively. Coyotes are quick to adapt or habituate to sounds, flashing lights, scarecrows, propane cannons; sound or visual stimuli will only be temporarily effective, if at all. Motion-sensitive lights may deter coyotes from approaching initially, but will likely fail over time with sufficient incentive (food sources) to enter your property. Some dog breeds (such as Great Pyrenees and others), and even llamas and donkeys, effectively defend against coyote predation of herds of sheep, for example. They are most effective when bonded to herd. This is best accomplished by raising the guardian animal with the herd they will eventually defend. Unfortunately, there are reports that coyote packs and mountain lions too may attack the guard animal itself. What Do You Do If Approached by A Coyote? 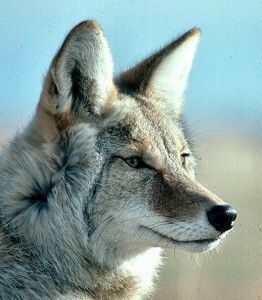 Removal of only a few problem coyotes from a local population may reinforce fear of humans in the remaining population. This can solve coyote problems in that locality for months or even year; BUT it doesn’t stop other more brazen coyotes from moving in to occupy vacant territories. The best way to deter coyotes from injuring you or your pets or herd is to understand their behaviors and behave proactively. Remember, we can’t keep a coyote from being a coyote, but we can learn to minimize their success or incentives to enter our territories. If you or your pet have been bitten or scratched by a coyote, wash the affected area immediately with soap and water. If the wound is deep, bleeding profusely, or exposes bone or major blood vessels and nerves, proceed immediately to the nearest veterinary or medical emergency center without delay. Pets may survive the initial attack with minimal veterinary care or following intensive care treatment, depending on the severity of the initial trauma. Unfortunately, even surviving pets may die of infection or complications of their injuries days, weeks or months after the attack. Any coyote inflicted injury should be evaluated right away by an emergency clinician for you or your pet. 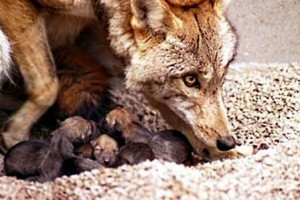 Rabies can be transmitted from an infected coyote or by handling your pet following attack by a rabid coyote’s saliva. Most coyotes are healthy predators, but rabies is always a possibility so make sure that your pet’s rabies vaccine is current, too. Report any incidents to local authorities (e.g. your local animal control agency or state Department of Fish & Game). They will appreciate your help in collecting data to better follow coyote trends in your area. 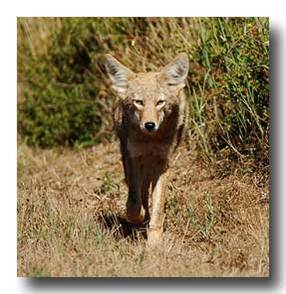 Coyote attacks on livestock should be reported to the county agricultural commissioner. 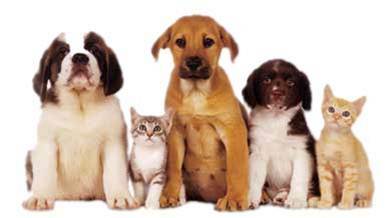 Dr. Stefanie Schwartz is a veterinarian and board certified veterinary behavior specialist. She is part of the specialty team of California Veterinary Specialists in Carlsbad and in Tustin, CA. For more information, please visit www.petbehavior.org or www.californiaveterinaryspecialists.com.